With a long (long) blast down the third-base line in New York’s Citi Field — off the just-called up Daisuke Matsuzaka, no less — Miguel Cabrera has given us the second thirty-second trot of the 2013 season! Way to go, Miggy! The trot officially clocked in at 30.94 seconds. Cabrera stepped up to the plate in the second inning with two outs and a runner on second. On the first pitch of the at-bat, Cabrera turned on the ball and drove it high and far down the left field line. He pulled the ball so far that Miggy had to step backwards towards the catcher to see where it flew, casually dropping his bat in the process. Eventually (at 4.87 seconds), the ball landed just fair of the foul pole. When the camera cut back to Cabrera (6.95 seconds), he seemed to be only just then starting his trot to first. There is no footage of the reigning Triple Crown winner touching first base, but he didn’t reach second until 17.21 seconds. He continued his slow trek around the bases, touching third at 23.25 seconds before slowing final steps at the plate and touching home in 30.94 seconds. * John Buck – June 20, 2012 – 36.32 seconds. Buck pulled his hamstring as he swung the bat. Technically, this trot doesn’t count because he stopped his trot for a moment a few steps out of the box. Luke Scott – June 30, 2010 – 35.76 seconds. The official leader as slowest trot of the Tater Trot Tracker era. Scott pulled his hamstring rounding first base and had to run for three bases in immense pain. Luis Hernandez – September 18, 2010 – 33.08 seconds. Hernandez was rounding the bases on a broken foot, which had happened on the previous pitch. Bobby Abreu – September 28, 2010 – 31.56 seconds. The (likely) final home run of Abreu’s career. Todd Helton – May 16, 2013 – 31.54 seconds. Todd Helton is slow and running on half a knee. This was bound to happen. 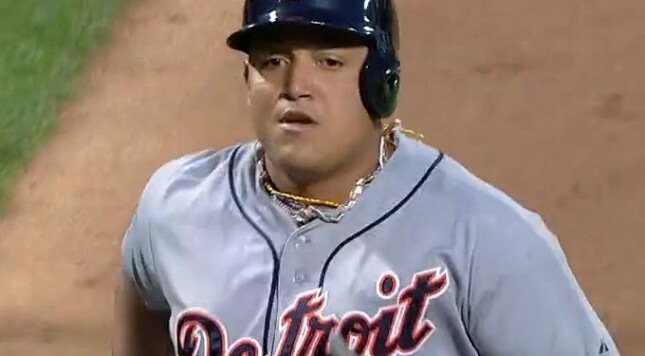 Miguel Cabrera – August 23, 2013 – 30.94 seconds. Like Helton, Cabrera is running on an injured leg. He also spent a long time admiring his blast/waiting to know if it would land fair. David Ortiz – May 24, 2010 – 30.59 seconds. The original 30-second man. Hanley Ramirez – July 1, 2012 – 30.3 seconds. Ramirez celebrated not hitting a home run in a month with this nice, long trot around Marlins Park. A list of home run hitters is never complete without Miguel Cabrera being on it somewhere. Glad he could finally join this group!